Every day is a battleground on the streets. 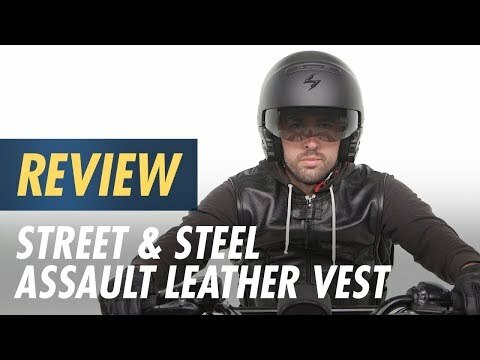 It's you and your motorcycle against an army of cagers, and the Street & Steel Assault vest is your uniform. Put it on, fire up the V-Twin, and ride off to victory. great vest. simple styling, and looks even better with colors sewn on. the fit is great, but i usually rode with a sweater or even just a t-shirt underneath. until i became an invisible target and got real friendly with a portion of asphalt on the highway. as i was sliding along, the vest took a beating and still held together to keep my core protected. unfortunately after sliding for awhile on asphalt at approx 70 MPH, the vest did ride up and my stomach got a bit of road rash, but the actual injury was kept to a minimum and it looks much worse than it really is. after i got out of the hospital, i saw my vest for the first time. the front stitching at the breast area gave way on both sides, as well as the area where the leather meets the fabric where the adjustment straps are located. one of the zipper pulls has made it's home on the freeway, but the other is still attached to the vest. i had a pair of sunglasses inside one of the inner pockets, which was absolutely destroyed in the accident. in the other inside pocket, i had some beef jerky which has stayed intact in it's packaging. i apparently slid on my back for a brief moment in time, and my back patch took the beating, but the leather itself is still in great condition. the adjustment straps ended up getting cut by emergency personnel, but thankfully the good samaritan who stopped to keep me stable and conscious was able to talk the emergency crew out of cutting anymore of the vest. 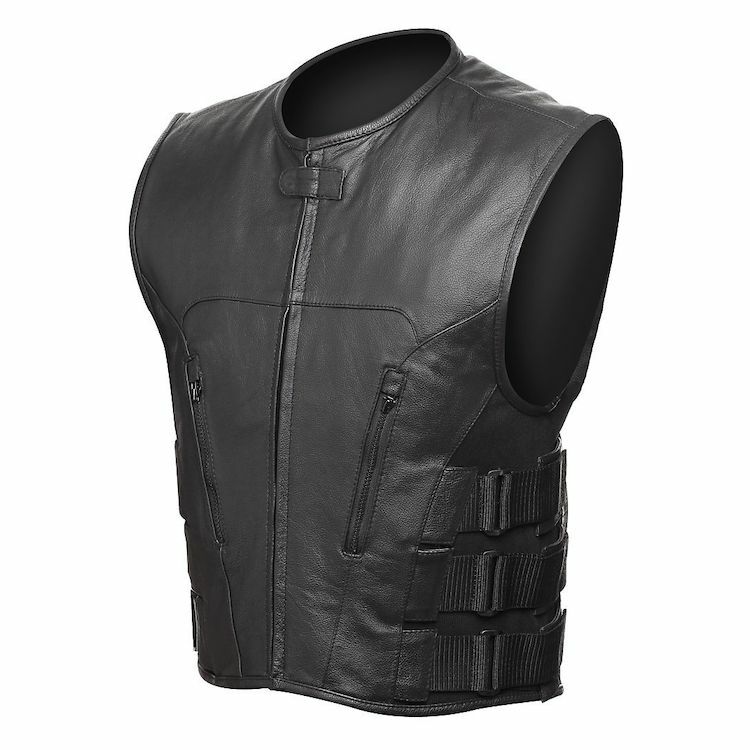 i will definitely be purchasing another vest, but this time a size larger to fit over proper riding gear. I checked this out vs. the Icon type and it isn't even close. The skin on this one is nice Cow vs. that dull look of Icon and this vest is MUCH cheaper. I'm in the OC chapter of Ruthless Ryderz. We are roughly 200-250 strong on the west coast. We have adopted this vest as our own, it feels and looks great. I'm prior Marine so it suits me well. The only bad thing is the straps on the sides, they are mostly for show, but they do adjust for about 2-3 inches. Other than that, we are all happy with the product. Thank you cycle gear, and DO NOT DISCONTINUE THIS PRODUCT! Please. We have seen the other vest that replaces this one, and it sux! Thanx again for this vest. My Husband loved it. He said he didn't feel the wind through it and it was very comfortable. im 6ft 215lbs and the 2x fits perfect over my 2x leather and also fits good over t shirt..looks great with patches too..
For the price it was a great buy it fits all the patches that I needed and still fits nice without a coat. Love it,love the styling and love the fit. I’m 280 pounds i tried on a 3xl didn’t even zip up should I move up to a 5x?